Boris Nemtsov, once a rising star in the Russian political firmament, has joined forces with Ukraine's new liberal president Viktor Yushchenko. His post as adviser to Mr Yushchenko might help export the "orange revolution" to Russia, some analysts say. Mr Nemtsov - who is not renouncing Russian citizenship - insists his work in Ukraine will focus entirely on economic issues. "The main thing is to normalise our relations and bring Russian investment into Ukraine," he told BBCRussian.com. But the western-orientated market reformer, who was a favourite of former Russian President Boris Yeltsin in the 1990s, does not deny seeking to influence the political climate in Russia. On Monday he was in Kiev to welcome Russian Foreign Minister Sergei Lavrov, who was on his first visit to Ukraine since the "orange revolution" - the massive street protests that helped secure Mr Yushchenko's election victory. "Ukraine's success on the path to European integration is also Russia's success, and their failures are also our failures," Mr Nemtsov told the BBC. "Our help to fraternal Ukraine ultimately means that the situation in Russia will get out of its present rut and the grey bureaucratic dictatorship will not last forever." Mr Nemtsov's new appointment drew a mixture of excitement and scepticism. A nuclear scientist and environmentalist, he shot into the post of Nizhny Novgorod regional governor after the fall of communism. The region, bristling with military industries, became a showcase for foreign investment in Russia - helped by Mr Nemtsov's media awareness. He quickly became one of Russia's most prominent politicians. 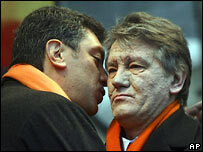 Mr Nemtsov was prominent during Ukraine's "orange revolution"
Many observers speculated that Mr Yeltsin was grooming Mr Nemtsov as his successor. He was appointed Russian deputy prime minister in charge of economic reform. But he came to regret that decision, for it heralded the beginning of his political decline. Any presidential ambitions he had were undermined by the August 1998 economic crisis, which also cost him the government job. Along with other prominent liberals, Mr Nemtsov then created the Union of Right Forces (SPS). Initially the party seemed very successful, gaining about 10% in the December 1999 election and forming an influential faction in the Russian parliament. But in the next few years the SPS attitude to Russia's new president Vladimir Putin evolved from conditional support to open opposition - and the party lost supporters. In the 2003 election the SPS failed to reach the 5% threshold needed to enter parliament. It even got fewer votes than Grigory Yavlinsky's liberal Yabloko movement, which also suffered a major defeat. 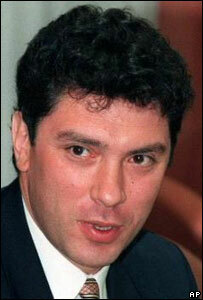 Mr Nemtsov resigned as SPS leader and pursued a business career, while making futile attempts to reunite Russian liberals, left in total disarray by the election catastrophe. Ukraine's "orange revolution" came as a breath of fresh air for the Russian liberals, because it made Mr Putin's increasingly authoritarian regime look not all that invincible. Mr Nemtsov took an active part in the opposition rallies in Kiev's Independence Square, and was frequently seen alongside Mr Yushchenko and his ally Yulya Tymoshenko during their campaign. Still his appointment as adviser came as a surprise. Mr Yavlinsky - his arch-rival for leadership of the Russian liberal camp - had been seen by some analysts as a possible candidate for the post of Ukrainian prime minister. Mr Yavlinsky hails from the Lviv region of western Ukraine and was even once a Ukrainian boxing champion. But instead Ms Tymoshenko was made prime minister. This was another shock for Moscow, which in the heat of the Ukrainian election battle even brought fraud charges against her. Ukrainian analysts quoted by the Russian government newspaper Rossiyskaya Gazeta said Mr Nemtsov's appointment was made "to bridge the gap between Mr Yushchenko and the Russian-speaking population". But other experts told the liberal Russian Gazeta newspaper that Mr Yushchenko was simply avenging Moscow for its open support of his main rival in the controversial elections, Viktor Yanukovych. "Ukraine is now criticising the Russian model of controlled democracy, while Mr Nemtsov represents the Russian opposition. I don't think he can be of much help," expert Anatoly Galchinsky told Gazeta. But according to analyst Konstantin Simonov, quoted by Rossiyskaya Gazeta, now Mr Nemtsov "will be able to say on every corner in Russia that he is a fully-fledged envoy of the orange revolution, claim the role of Russia's Yushchenko and lead a Russian 'orange fifth column'".